As I’ve learned more about healthy eating and the dangers of processed foods, I’ve really made an effort to cut back on refined sugar. More and more research now characterizes sugar as ‘toxic’ and some studies indicate eating sugar creates a similar response in the brain as drug use. Read: sugar is addictive and consuming it creates a vicious cycle of blood sugar highs and lows. For me, cutting sugar isn’t just about losing weight, it’s about eliminating the stuff that impairs my body’s ability to function optimally. Sure I can make room in my diet for a zebra cake or two, but at the end of the day, processed sugar only makes me feel tired, sluggish, bloated, and a little guilty. Don’t get me wrong, I still love a little something sweet. Most days there’s an epic internal battle waging within me to avoid the donuts in the office or the giant slice of chocolate cake after a date night out. On the days I pass on those treats and instead enjoy a square or two of dark chocolate with a dried fig or date I feel like a major winner. And you know what, while it’s taken some getting used to, that small piece of dark chocolate is now (mostly) satisfying. I make an effort to manage my indulgences by allocating a certain number of treats per week. Two is the magic number or me. Maybe that sounds like too many to some who only splurge for special occasions, or waaaaay too low for those just starting to cut back on sweet treats. Whatever number you decide, I find it’s helpful to decide on it before the week starts, that way you’re not caught off guard by an opportunity to indulge. For one of my weekly treats, I love to use a few healthy ingredients to create something that tastes rich, creamy, even a little decadent, but that’s still relatively healthy. 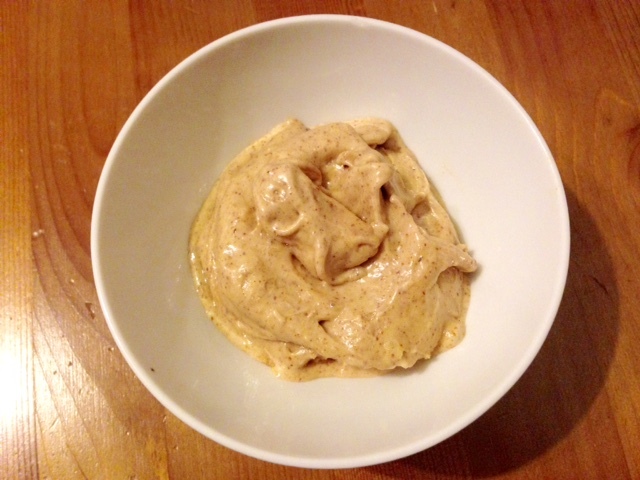 My peanut butter banana vegan ice cream always hits the spot when I need something full-on desserty after my dinner. Made with just five ingredients, this “ice cream” contains no dairy, no refined sugar, and no preservatives or chemicals. That’s a down right miracle in my book. And with half of the world it seems on some crazy, new-fangled diets, this recipe works for vegans and Paleo folks alike. Note: the recipe below is just a starting point. Use it as a foundation and then start experimenting with ingredients you love. If you’re a chocoholic like me, add a tablespoon of cocoa power and splash of coconut milk. You can also mix in things like dried cherries, chocolate chips, or fresh fruit to create your own fro-yo set up at home. 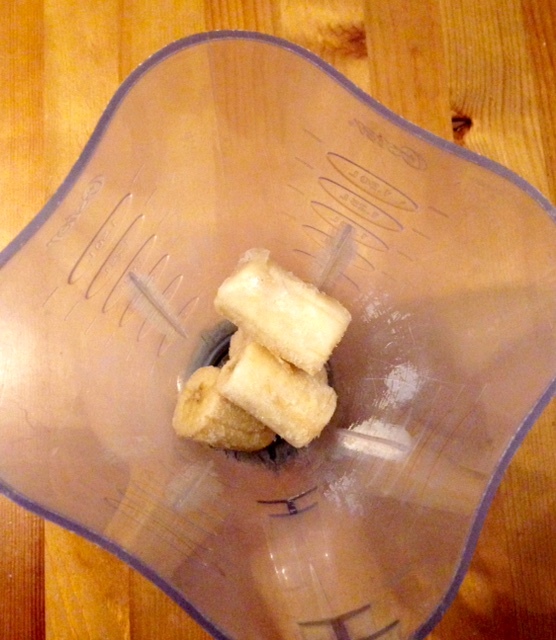 Place frozen banana in the blender and turn on high. 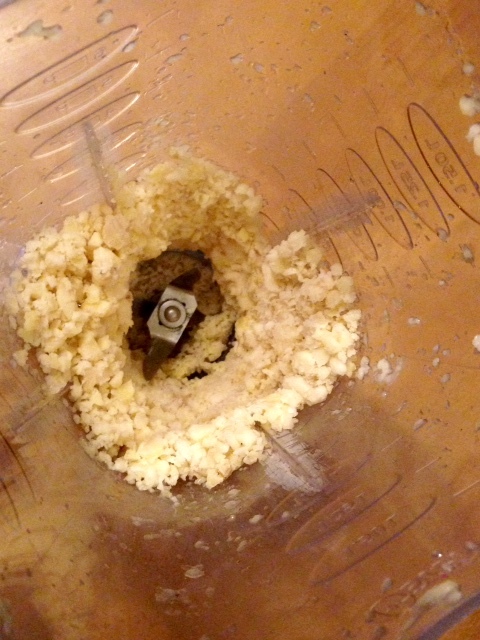 Process the banana until it’s broken into small pea-sized pieces. Add the rest of the ingredients and process on high again until all ingredients have combined into a homogenous mixture, about a minute or so.